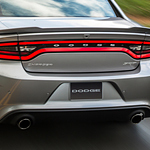 In terms of power, agility and handling, the 2019 Dodge Charger is at the top of its class. Having a full-size body, this sporty sedan is ready to be taken for a test drive at Razzari Commercial Center. When you take a seat in the racing-style cockpit, you could connect your smartphone to the Android Auto portal or Apple CarPlay suite. The updated Uconnect infotainment system includes the 4C NAV system with colored maps and traffic data by SiriusXM. You can also enhance the GPS information with Google Maps and other external applications. This Dodge sedan has a media hub in the center console for convenient connectivity. Dual-charging USB ports are universally compatible with mobile gadgets. An auxiliary port and 12-volt power outlet are installed in the media hub. Additionally, the 2019 Charger is available with up to 19 speakers that were designed by Harman Kardon, a global pioneer in acoustic technology.